6.75" Soccer Monster Trophies. These monster trophies are perfect for the scorer in your group. 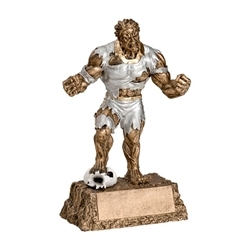 This unique award is perfect for Soccer MVP, Most Goals Scored, or Best Defender. Made of resin. We also offer the option to add an additional base (see picture) which adds an extra 1" in height. At this price you can also get one for the whole team.